I have some serious swatch spam tonight of a new collection from Black Dahlia Lacquer called the Capital Collection. The collection has 12 new shades and contains a mix of glitters, shimmers, flakies and holos. The formula on all these was great. I used two coats for all my swatches except the glitter bomb, followed with Seche Vite top coat. 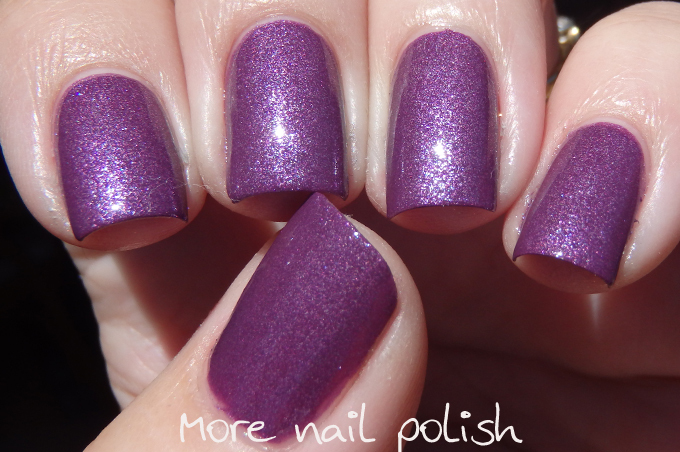 90 in November - a plum purple with a shimmery micro fine glass fleck. 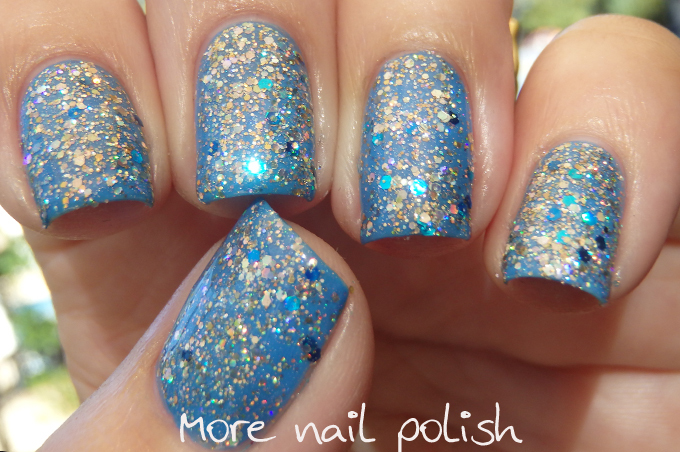 Austin city limits - a periwinkle blue holo with blue glass flecks, gold shimmer and gold micro glitter. One of my favourites from the collection. Barton Springs Babe - green crelly with blue-green shimmer and darker blue flakies. Blue Bonnet Bingo - a bright blue crelly with purple shimmer and lighter blue flakies. 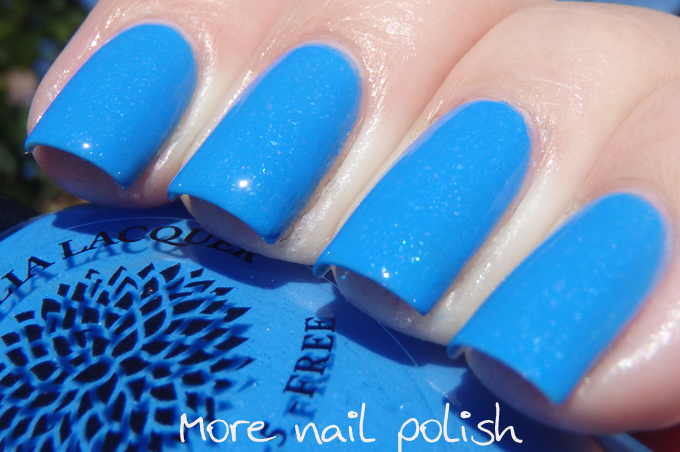 I love this bright blue, so perfect for our summer right now. Capital Rose Garden - a soft neutral slightly coral pink with a soft scattered holo finish. This one was really flattering on and a beautiful office appropriate colour. Congress Avenue Bats - gun metal gray with a scattered holo finish. My bottle is called Congress Avenue Bats, but the version listed on the website is called South Congress Bats. This was another favourite for me. Lady Bird Lake - a navy blue holo with added gold shimmer and gold glass flecks. This is a real winner for me with the combo of blue and gold. My Butter Half - a gold shimmer in a pastel yellow base with gold micro glitter. This is an interesting polish, it's one of those shades that I don't know whether to call it a yellow or a gold. SXSW Fever - dark teal with green shimmer and bright blue flakies. Woke up on 6th street - This polish is easily a full coverage glitter, but I wore it as one coat over Blue Bonnet Bingo. I love the glitter payoff in this, so much glitter for just one coat. It was a little thick because of the glitter, but certainly nothing unwieldy. 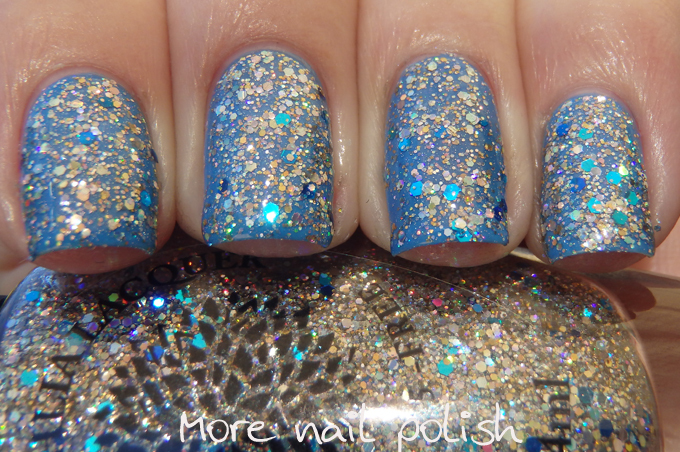 The polish is packed with holographic silver glitter and strong accents of gold and a few aqua and navy glitters. A really pretty glitter bomb. These are really pretty! I think my favorites have to be SXSW Fever, Austin City Limits, and Blue Bonnet Bingo. OMG they're All gorgeous !!!! And particularly Congress avenue bats!! !